For the town of Kilauea on Kauai, see Kilauea, Hawaii. 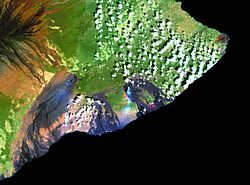 Kīlauea (/ˌkiːlaʊˈeɪə/, US: /ˌkɪləˈweɪə/; Hawaiian: [kiːlɐwˈwɛjə]) is an active shield volcano in the Hawaiian Islands, and the most active of the five volcanoes that together form the island of Hawaiʻi. Located along the southern shore of the island, the volcano is between 210,000 and 280,000 years old and emerged above sea level about 100,000 years ago. Kīlauea's eruptive history has been a long and active one; its name means "spewing" or "much spreading" in the Hawaiian language, referring to its frequent outpouring of lava. The earliest lavas from the volcano date back to its submarine preshield stage, samples having been recovered by remotely operated underwater vehicles from its submerged slopes; samples of other flows have been recovered as core samples. Lavas younger than 1,000 years cover 90 percent of the volcano's surface. The oldest exposed lavas date back 2,800 years. The first well-documented eruption of Kīlauea occurred in 1823 (Western contact and written history began in 1778). Since then, the volcano has erupted repeatedly. Most historical eruptions occurred at the volcano's summit or its eastern rift zone, and were prolonged and effusive in character. The geological record shows, however, that violent explosive activity predating European contact was extremely common; in 1790 one such eruption killed more than 400 people, making it the deadliest volcanic eruption in what is now the United States. Should explosive activity start anew, the volcano would become much more of a danger to humans. Kīlauea's current eruption dates back to January 3, 1983, and is by far its longest-duration historical period of activity, as well as one of the longest-duration eruptions in the world; as of January 2011, the eruption has produced 3.5 km3 (1 cu mi) of lava and resurfaced 123.2 km2 (48 sq mi) of land. Kīlauea's high state of activity has a major impact on its mountainside ecology, where plant growth is often interrupted by fresh tephra and drifting volcanic sulfur dioxide, producing acid rains particularly in a barren area south of its southwestern rift zone known as the Kaʻū Desert. Nonetheless, wildlife flourishes where left undisturbed elsewhere on the volcano and is highly endemic thanks to Kīlauea's (and the island of Hawaiʻi's) isolation from the nearest landmass. Historically, the five volcanoes on the island were considered sacred by the Hawaiian people, and in Hawaiian mythology Kīlauea's Halemaʻumaʻu Crater served as the body and home of Pele, goddess of fire, lightning, wind, and volcanoes. William Ellis, a missionary from England, gave the first modern account of Kīlauea and spent two weeks traveling along the volcano; since its foundation by Thomas Jaggar in 1912, the Hawaiian Volcano Observatory, located on the rim of Kīlauea caldera, has served as the principal investigative and scientific body on the volcano and the island in general. In 1916, a bill forming the Hawaii Volcanoes National Park was signed into law by President Woodrow Wilson; since then, the park has become a World Heritage Site and a major tourist destination, attracting roughly 2.6 million people annually. Like all Hawaiian volcanoes, Kīlauea was created as the Pacific tectonic plate moved over the Hawaiian hotspot in the Earth's underlying mantle. The Hawaii island volcanoes are the most recent evidence of this process that, over 70 million years, has created the 6,000 km (3,700 mi)-long Hawaiian–Emperor seamount chain. The prevailing, though not completely settled, view is that the hotspot has been largely stationary within the planet's mantle for much, if not all of the Cenozoic Era. However, while the Hawaiian mantle plume is well understood and extensively studied, the nature of hotspots themselves remains fairly enigmatic. Kīlauea is one of five subaerial volcanoes that make up the island of Hawaiʻi, created by the Hawaii hotspot. 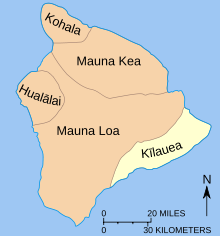 The oldest volcano on the island, Kohala, is more than a million years old, and Kīlauea, the youngest, is believed to be between 300,000 and 600,000 years of age; Lōʻihi Seamount, on the island's flank, is younger and has yet to breach the surface. Thus Kilauea is the second youngest volcano in the Hawaiian–Emperor seamount chain, a chain of shield volcanoes and seamounts extending from Hawaii to the Kuril–Kamchatka Trench in Russia. Following the pattern of Hawaiian volcano formation, Kīlauea started as a submarine volcano, gradually building itself up through underwater eruptions of alkali basalt lava before emerging from the sea with a series of explosive eruptions about 50,000 to 100,000 years ago. Since then, the volcano's activity has likely been as it is now, a continual stream of effusive and explosive eruptions of roughly the same pattern as its activity in the last 200 or 300 years. At most 600,000 years old, Kīlauea is still quite young for a Hawaiian volcano; the oldest volcano on the island, the northwestern Kohala, experienced almost 900,000 years of activity before going extinct. The volcano's foreseeable future activity will likely be much like it has been for the past 50,000 to 100,000 years; Hawaiian and explosive activity will make Kīlauea taller, build up its rift zones, and fill and refill its summit caldera. Kīlauea has been active throughout its history. Since 1918, Kīlauea's only prolonged period of rest was an 18-year pause between 1934 and 1952. The bulk of Kīlauea consists of solidified lava flows, intermittent with scattered volcanic ash and tephra sourced from relatively lower-volume explosive eruptions. Much of the volcano is covered in historical flows, and 90 percent of its surface dates from the last 1,100 years. Kīlauea built itself up from the seafloor over time, and thus much of its bulk remains underwater; its subaerial surface is in the form of a gently sloping, elongate, decentralized shield with a surface area of approximately 1,500 km2 (579 sq mi), making up 13.7 percent of the island's total surface area. Kīlauea lacks a topographical prominence, appearing only as a bulge on the southeastern flank of the nearby Mauna Loa; because of this, both native Hawaiians and early geologists considered it an active satellite of its more massive neighbor. However, analysis of the chemical composition of lavas from the two volcanoes shows that they have separate magma chambers, and are thus distinct. Nonetheless, their proximity has led to a historical trend in which high activity at one volcano roughly coincides with low activity at the other. When Kīlauea lay dormant between 1934 and 1952, Mauna Loa became active, and when the latter remained quiet from 1952 to 1974, the reverse was true. This is not always the case; the 1984 eruption of Mauna Loa started during an eruption at Kīlauea, but had no discernible effect on the Kīlauea eruption, and the ongoing inflation of Mauna Loa's summit, indicative of a future eruption, began the same day as new lava flows at Kīlauea's Puʻu ʻŌʻō crater. In 2002, Kilauea experienced a high-volume effusive episode at the same time that Mauna Loa began inflating. This unexpected communication is evidence of crustal-level interactions between Mauna Loa and Kīlauea, even though these two volcanoes are thought to be fairly independent of each other. Geologists have suggested that "pulses" of magma entering Mauna Loa's deeper magma system may have increased pressure inside Kīlauea and triggered the concurrent eruptions. Kīlauea has a large summit caldera, measuring 4 by 3.2 km (2.5 by 2.0 mi) with walls up to 120 m (400 ft) high, breached by lava flows on the southwestern side. It is unknown if the caldera was always there or if it is a relatively recent feature, and it is possible that it has come and gone throughout Kīlauea's eruptive history. What is known is that the summit caldera likely formed over several centuries, with its construction estimated to have begun about 500 years ago, and its present form was finalized by a particularly powerful eruption in 1790. A major feature within the caldera is Halemaʻumaʻu Crater, a large pit crater and one of Kīlauea's most historically active eruption centers. The crater is approximately 920 m (3,018 ft) in diameter and 85 m (279 ft) deep, but its form has varied widely through its eruptive history; the floor of the Halemaʻumaʻu Crater is now mostly covered by flows from its 1974 eruption. Kīlauea has two rift zones radiating from its summit, one leading 125 km (78 mi) out to the east, the other 35 km (22 mi) long and trending towards the southwest. A series of fault scarps connecting the two rift zones form the Koa'e Fault Zone. Tectonic extension along both rift zones is causing Kīlauea's bulk to slowly slide seaward off its southern flank at a rate of about 6 to 10 cm (2 to 4 in) per year, centered on a basal décollement fault 7 to 9 km (4 to 6 mi) beneath the volcano's surface. The eastern rift zone in particular is a dominant feature on the volcano; it is almost entirely covered in lava erupted in the last 400 years, and at its crest near the summit is 2 to 4 km (1 to 2 mi) wide. Non-localized eruptions, typical of rift zone activity, have produced a series of low-lying ridges down the majority of the east rift zone's length. Its upper segment is the most presently active section of the volcano, and is additionally the site of a number of large pit craters; its lower extremity reaches down Kīlauea's submerged flank to a depth of more than 5,000 m (16,400 ft). By contrast, the much smaller southwestern rift has been quiet since a rifting episode in 1974, and to date, has not been involved in the current eruptive cycle at all. The southwestern rift zone's extremity is also underwater, although its submarine length is more limited. The southwestern rift zone also lacks a well-defined ridge line or a large number of pit craters, evidence that it is also geologically less active than the eastern rift zone. A prominent structure on Kīlauea's southern flank is the Hilina fault system, a highly active fault slipping vertically an average of 2 to 20 mm (1⁄16 to 13⁄16 in) per year[clarification needed] along the system. Its physiographic province is 500 m (1,640 ft) deep, but it is unknown whether it is a shallow listric fault or if it penetrates to the very base of the volcano. In connection with the 2018 lower Puna eruption the Hawaiian Volcano Observatory published some facts leading to the conclusion, that a catastrophic collapse would be incredibly remote. A number of cinder cones, satellite shields, lava tubes, and other eruptive structures also dot the volcano, evidence of its recent activity. Kīlauea has some interactions with Mauna Loa, its larger neighbor and only other recently active volcano on the island; interspersed lava flows and ash deposits belonging to its neighbor have been found on its flanks, and some of Mauna Loa's flows are, in turn, blanketed in Kīlauea tephra. In particular, the saddle between the two volcanoes is currently depressed, and is likely to fill over in the future. All historical eruptions at Kīlauea have occurred at one of three places: its summit caldera, its eastern rift zone, or its southwestern rift zone. Half of Kīlauea's historical eruptions have occurred at or near Kīlauea's summit caldera. Activity there was nearly continuous for much of the 19th century, capped by a massive explosive eruption in 1924, before petering out by 1934. Recent activity has mostly shifted to Kīlauea's eastern rift zone, the site of 24 historical eruptions, located mostly on its upper section; by contrast, the volcano's southwestern rift zone has been relatively quiet, and has only been the site of five events to date. Graph summarizing the eruptions of Kïlauea during the past 200 years. The Pu‘u ‘Ö‘ö- Kupaianaha eruption has continued into the 21st century. Information is sketchy for eruptions before 1823, when the first missionaries arrived on the Island of Hawai‘i. The total duration of eruptive activity in a given year, shown by the length of the vertical bar, may be for a single eruption or a combination of several separate eruptions. Geologists have dated and documented dozens of major eruptions over the volcano's long history, bridging the long gap between Kīlauea's oldest known rock and only extremely recent written records and historical observation. Historical lava flows from the volcano are generally recovered by scientists in one of three ways. The oldest flows, dating back 275,000 to 225,000 years, have been recovered from Kīlauea's submerged southern slope by ship-towed remotely operated vehicles. These lavas exhibit forms characteristic of early, submerged preshield-stage eruptive episodes, from when the volcano was still a rising seamount that had not yet breached the ocean surface, and their surface exposure is unusual, as in most other volcanoes such lavas would have since been buried by more recent flows. The second method of recovering older rock is through the drilling of deep core samples; however, the cores have proved difficult to date, and several samples from depths of around 1,700 m (5,600 ft) that suggested dates as old as 450,000 years have since been found erroneous. More reliable paleomagnetic dating, limited to rocks dating from after Kīlauea's emergence from the sea, has suggested ages of around 50,000 years. Exposed flows above sea level have proved far younger. Some of the oldest reliably dated rock, 43,000 years old, comes from charcoal sandwiched beneath an ash layer on a fault scarp known as Hilina Pali; however, samples dated from higher up the scarp indicate ash deposition at an average rate of 6 m (20 ft) per thousand years, indicating that the oldest exposed flows, from the base of the feature, could date back as far as 70,000 years. This date is similar to that of the oldest dated extant lava flow, a southwestern rift zone flow with an uncorrected radiocarbon dating of approximately 4650 BC. The oldest well-studied eruptive product from Kīlauea is the Uwēkahuna Ash Member, the product of explosive eruptions between 2,800 and 2,100 years ago. Although it has since been largely buried by younger flows, it remains exposed in some places, and has been traced more than 20 km (12 mi) from the volcano's caldera, evidence of very powerful eruptions. Evidence suggests the existence of an active eruptive center at this time, termed the Powers Caldera, 2 km (1 mi) away from the modern one. At least 1,200 years ago, lava from the Powers Caldera overtopped its rim and solidified the structure; this was followed by a period of very voluminous tube-fed pāhoehoe flows from the summit. Following cessation of activity around 400 years ago, eruptions re-centered on the eastern part of Kīlauea's summit, and concurrently activity increased at the northern end of the eastern rift zone. The earliest reliable written records of historical activity date back to about 1820, and the first well-documented eruption occurred in 1823, when the volcano was first put under observation; although Native Hawaiians are thought to have first settled on the island around 1,500 years ago, oral records predating European arrival on the island are few and difficult to interpret. One pre-contact eruption in particular, a phreatomagmatic event in 1790, was responsible for the death of a party of warriors, part of the army of Keōua Kuahuʻula, the last island chief to resist Kamehameha I's rule; their death is evidenced by a set of footprints preserved within the Hawai‘i Volcanoes National Park which are listed on the National Register of Historic Places. Kīlauea has been the site of 61 separate eruptions since 1823, easily making it one of the most active volcanoes on Earth. During its observed history, the volume of lava erupted by Kīlauea has varied widely. In 1823 Kīlauea's summit caldera was far deeper than it is today, but was in the process of filling up under nearly continuous summit eruption, with 3 km3 (1 cu mi) of lava erupted there alone by 1840. The period between 1840 and 1920 saw approximately half that in eruptive volume, and in the thirty years between then and about 1950, the volcano was unusually quiet and exhibited very little activity; Kīlauea's eruptive volume has increased steadily since then, with present activity comparable to that of the early 1800s. The length and origin of these eruptions have also varied. Events last anywhere between days and years, and occur at a number of different sites. Half of all eruptions occur at or near Kīlauea's summit caldera. Activity there was nearly continuous for much of the 19th century, and after a reprieve between 1894 and 1907, continued onwards until 1924. There have been five historical eruptions at the volcano's relatively quiet southwestern rift zone, and 24 along its more active eastern rift zone, mostly along its upper section. The volcano's observed history has mostly been one of effusive eruptions; however, this is a relatively recent occurrence. Prior to the arrival of the first Europeans on the island, Kīlauea was the site of regular explosive activity, evidenced then by tribal chants referencing the volcano's fickle nature, and today by geological records of an explosively active mode of past activity. Although explosive activity still occurs at the volcano, it is not as intense as it once was, and the volcano would become much more dangerous to the general public if it returned to its old phase of activity once more. Kīlauea erupted in 1823 and 1832, but the first major eruption since the 1790 event occurred in 1840, when its eastern rift zone became the site of a large, effusive Hawaiian eruption over 35 km (22 mi) of its length, unusually long even for a rift eruption. The eruption lasted for 26 days and produced an estimated 205 to 265 million cubic meters of lava; the light created by the event was so intense that one could reportedly read a newspaper in Hilo at night, 30 km (19 mi) away. The volcano was active again in 1868, 1877, 1884, 1885, 1894, and 1918, before its next major eruption in 1918–1919. Halemaʻumaʻu, then a small upwelling in the caldera floor, was topped by a lava lake that then drained, before refilling again, forming an enormous lava lake and nearly reaching the top edge of the caldera before draining once more. This activity eventually gave way to the construction of Mauna Iki, building up the large lava shield within the caldera over a period of eight months. The eruption also featured concurrent rift activity and a large amount of lava fountaining. Activity in 1921–1923 followed. The next major eruption occurred in 1924. Halemaʻumaʻu Crater, a fully formed pit crater after the 1919 event and the site of a sizable lava lake, first drained, then quickly began sinking into the ground, deepening to nearly 210 m (689 ft) beneath a thick cloud of volcanic ash. Explosive activity began on May 10 of that year, blowing rock chunks weighing as much as 45 kg (99 lb) 60 m (197 ft) out, and smaller fragments weighing about 9 kg (20 lb) out as far as 270 m (886 ft), and, after a brief reprieve, intensified through a major blast on May 18, when an enormous explosive event caused the eruption's only fatality. The eruption continued and formed numerous eruption columns up to and beyond 9 km (6 mi) in height, before slowly petering down and ending by May 28. Volcanic activity was soon confined to the summit, and ceased completely after 1934. After the Halemaʻumaʻu event, Kīlauea remained relatively quiet, and for a time, completely silent, with all activity confined to the summit. The volcano came alive again in 1952, with an enormous lava fountain 245 m (800 ft) high at the Halemaʻumaʻu Crater. Multiple continuous lava fountains between 15 and 30 m (50 and 100 ft) persisted, and the eruption lasted 136 days. Eruptions occurred soon after in 1954, 1955, and 1959, capped by a large event in 1960, when fissure-based phreatic eruption and earthquake activity gave way to a massive ʻaʻā flow that overran multiple evacuated communities and resorts; the resulting summit deflation eventually caused the ever-active Halemaʻumaʻu to collapse even further. Following the event, eruptive events yearly and nearly continuous, a state of activity that remains today. The period 1967–1968 saw a particularly large, 80-million-cubic-meter, 251-day event from Halemaʻumaʻu Crater. This event was superseded the very next year by the marathon Mauna Ulu eruption, a large effusive eruption which lasted from May 24, 1969 to July 24, 1974 and added 230 acres (93 ha) of new land to the island. After eruptive activity had died down, there was a magnitude 7.2 earthquake that caused a partial summit collapse, after which activity did not resume at Kīlauea until 1977. At the time, Mauna Ulu was the longest flank eruption of any Hawaiian volcano in recorded history. The eruption created a new vent, covered a large area of land with lava, and added new land to the island. The eruption started as a fissure between two pit craters, ʻĀloʻi and ʻAlae, where the Mauna Ulu shield would eventually form. Both pāhoehoe and ʻaʻā lava erupted from the volcano. Early on, fountains of lava burst out as much as 540 meters (1772 ft) high. In early 1973, an earthquake occurred that caused Kīlauea to briefly stop erupting near the original Mauna Ulu site and instead erupt near the craters Pauahi and Hiʻiaka. The most recent major eruption at Kīlauea has been the longest duration of any observed eruption. The current Kīlauea eruption began on January 3, 1983, along the eastern rift zone. The vent produced vigorous lava fountains that quickly built up into the Puʻu ʻŌʻō cone, sending lava flows down the volcano's slope. In 1986, activity shifted down the rift to a new vent, named Kūpaʻianahā, where it took on a more effusive character. Kūpaʻianahā built up a low, broad volcanic shield, and lava tubes fed flows extending 11 to 12 km (about 7 mi) to the sea. Between 1986 and 1991, the connection between Chain of Craters Road and Hawaii Route 130 was cut, and the community of Kapa’ahu, the village of Kalapana, and the subdivisions of Kālapana Gardens and Royal Gardens were lost to the lava. A black sand beach at Kaimū was also engulfed. In 1992, the eruption moved back to Puʻu ʻŌʻō, but continued in the same manner, covering nearly all of the 1983–86 lava flows and large areas of coastline. As of the end of 2016, the east rift zone eruption had produced 4.4 km3 (1 cu mi) of lava, covered 144 km2 (56 sq mi) of land, added 179 ha (442 acres) of land to the island, destroyed 215 structures, and buried 14.3 km (9 mi) of highway under lava as thick as 35 m (115 ft). 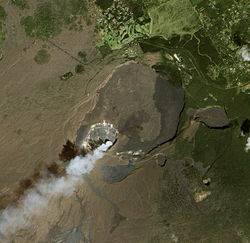 In addition to the nearly continuous activity at Puʻu ʻOʻo and other vents on the east rift zone, a separate eruption began at Kilauea's summit in March 2008. On March 19, 2008, following several months of increased sulfur dioxide emissions and seismic tremor, a new vent opened at Halemaʻumaʻu Crater at Kilauea's summit in an explosive eruption. Following this event, the new crater formed in the explosion, informally named the "Overlook Crater," emitted a thick gas plume that obscured views into the vent. Several other explosive events occurred at the vent throughout 2008. On September 5, 2008, scientists observed a lava pond deep within the Overlook Crater for the first time. Beginning in February 2010, a lava pond was visible at the bottom of the crater almost continuously through the beginning of May 2018. Lava briefly overflowed the vent onto the floor of Halemaʻumaʻu Crater in April and May 2015, October 2016, and April 2018. Beginning in March 2018, Hawaiian Volcano Observatory began to detect rapid inflation at Pu‘u ‘Ō‘ō, leading scientists to warn that the increased pressure could lead to the formation of a new vent at Kilauea. Following weeks of increased pressure, the crater floor of the cone of Puʻu ʻŌʻō collapsed on April 30, 2018, as magma migrated underground into the lower Puna region of Kilauea's lower east rift zone. Over the next few days, hundreds of small earthquakes were detected on Kīlauea’s East rift zone, leading officials to issue evacuation warnings. On May 3, 2018, new fissures formed, and lava began erupting in lower Puna after a 5.0 earthquake earlier in the day, causing evacuations of the Leilani Estates and Lanipuna Gardens subdivisions. By May 31, 87 houses in Leilani Estates and nearby areas had been destroyed by lava. Advancing lava flows caused additional evacuation orders, including the town of Kapoho. By June 4, with the lava having crossed through Kapoho and entered the ocean, the confirmed number of houses lost had reached 159. Two weeks later, the confirmed number of homes lost was 533,[dead link] and as of June 25 it had risen to 657. Together with the outbreak of lava in lower Puna, a lava lake at Halemaʻumaʻu Crater at Kilauea's summit began to drop on May 2, 2018. The Hawaiian Volcano Observatory warned that the lowering of the lava lake increased the potential for phreatic (steam) explosions at the summit caused by interaction of magma with the underground water table, similar to the explosions that occurred at Halemaʻumaʻu in 1924. These concerns prompted the closure of Hawaiʻi Volcanoes National Park. On May 17, at approximately 4:15 a.m., an explosive eruption occurred at Halemaʻumaʻu, creating a plume of ash 30,000 feet into the air. This marked the beginning of a series of vigorous explosions that have produced significant ash plumes from Halemaʻumaʻu. These explosions, accompanied by large earthquakes and inward slumping and collapse within and around Halemaʻumaʻu Crater, continued until early August. In 2018, the United States Geological Survey National Volcanic Threat Assessment gave Kīlauea an overall threat score of 263, and ranked it first among volcanoes in the United States most likely to threaten lives and infrastructure. The Global Volcanism Program has assigned a Volcanic Explosivity Index (VEI; the higher the number, the more explosive) to all except five of Kīlauea's ninety-five known eruptions of the last 11,700 years. The eruption of 1790 has a VEI of 4. The 1983–2018 eruption has a VEI of 3. The eruptions of 1820, 1924, 1959 and 1960 have a VEI of 2. The eruptions of 680, 1050, 1490, 1500, 1610, 1868 and four eruptions in 1961 have a VEI of 1. The other seventy-four eruptions have a VEI of 0. 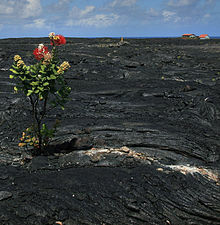 ʻŌhiʻa (Metrosideros polymorpha) growing on a barren lava field dating from 1986, formerly the village of Kalapana, Hawaii. The myrtle in this picture, taken in 2009, may have since been covered over—fresh flows in 2010 partially re-covered the area. Because of its position more than 3,000 kilometers (2,000 mi) from the nearest continental landmass, the island of Hawaiʻi is one of the most geographically isolated landmasses on Earth; this in turn has strongly influenced its ecology. The majority of the species present on the island are endemic to it and can be found nowhere else on Earth, the result of an isolated evolutionary lineage sheltered from external biotic influence; this makes its ecosystem vulnerable both to invasive species and human development, and an estimated third of the island's natural flora and fauna has already gone extinct. Kīlauea's ecological community is additionally threatened by the activity of the volcano itself; lava flows often overrun sections of the volcano's forests and burn them down, and volcanic ash distributed by explosive eruptions often smothers local plant life. Layers of carbonized organic material at the bottom of Kīlauea ash deposits are evidence of the many times the volcano has wrought destruction on its own ecosystem and that of its neighbor Mauna Loa, and parts of the volcano present a dichotomy between pristine montane forest and recently buried volcanic "deserts" yet to be recolonized. Kīlauea's bulk affects local climate conditions through the influence of trade winds coming predominantly from the northeast, which, when squeezed upwards by the volcano's height, result in a moister windward side and a comparatively arid leeward flank. The volcano's ecology is further complicated by height, though not nearly as much as with its other, far taller neighbors, and by the local distribution of volcanic products, making for varied soil conditions. The northern part of Kīlauea is mostly below 1,000 m (3,281 ft) and receives more than 75 in (191 cm) mean annual rainfall, and can mostly be classified as a lowland wet community; farther south, the volcano has squeezed out much of the precipitation and receives less than 50 in (127 cm) mean annual rainfall, and is considered mostly a lowland dry environment. The 'amakihi (Chlorodrepanis virens) is one of the many birds that live on the volcano's flanks. Much of Kīlauea's southern ecosystem lies within the Hawaiʻi Volcanoes National Park, where a’e ferns, ʻōhiʻa trees (Metrosideros polymorpha), and hapu’u of the genus Cibotium are common. The park hosts a large variety of bird species, including the 'apapane (Himatione sanguinea); the 'amakihi (Hemignathus virens); the 'i'iwi (Vestiaria coccinea); the ‘ōma’o (Myadestes obscurus), the ʻelepaio (Chasiempis sp. 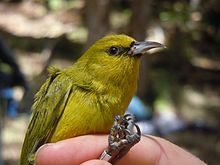 ); and the endangered 'akepa (Loxops coccineus), 'akiapola'au (Hemignathus munroi), nēnē (Branta sandvicensis), ʻuaʻu (Pterodroma sandwichensis), and ʻio (Buteo solitarius) species. The Kīlauea coast also hosts three of the nine known critically endangered hawksbill sea turtle (Eretmochelys imbricata) nesting sites on the island. Some of the area alongside Kīlauea's southwestern rift zone takes the form of the unusual Kaʻū Desert. Although not a "true" desert (rainfall there exceeds the maximum 1,000 mm (39 in) a year), precipitation mixing with drifting volcanic sulfur dioxide forms acid rain with a pH as low as 3.4, greatly hampering regional plant growth. The deposited tephra particulates make the local soil very permeable. Plant life in the region is practically nonexistent. Kīlauea's northern lowland wet-forest ecosystem is partially protected by the Puna Forest Reserve and the Kahauale`a Natural Area Reserve. At 27,785 acres (11,244 ha), Wao Kele in particular is Hawaiʻi's largest lowland wet forest reserve, and is home to rare plant species including hāpuʻu ferns (Cibotium spp. ), 'ie'ie vines (Freycinetia arborea), and kōpiko (Psychotria mariniana), some of which play a role in limiting invasive species' spread. ʻOpeʻapeʻa (Lasiurus cinereus semotus) ʻio (Buteo solitarius), common ʻamakihi (Hemignathus virens), and nananana makakiʻi (Theridion grallator) live in the trees. There are thought to be many more as-yet-undocumented species within the forest. Wao Kele's primary forest tree is ʻōhiʻa lehua (Metrosideros polymorpha). The first Ancient Hawaiians to arrive on Hawaii island lived along the shores, where food and water were plentiful. Flightless birds that had previously known no predators became a staple food source. Early settlements had a major impact on the local ecosystem, and caused many extinctions, particularly amongst bird species, as well as introducing foreign plants and animals and increasing erosion rates. The prevailing lowland forest ecosystem was transformed from forest to grassland; some of this change was caused by the use of fire, but the main reason appears to have been the introduction of the Polynesian rat (Rattus exulans). The summits of the five volcanoes of Hawaii are revered as sacred mountains. Hawaiians associated elements of their natural environment with particular deities. In Hawaiian mythology, the sky father Wākea marries the earth mother Papa, giving birth to the Hawaiian Islands. Kīlauea itself means "spewing" or "much spreading" in Hawaiian, referencing its high state of activity, and in Hawaiian mythology, Kīlauea is the body of the deity Pele, goddess of fire, lightning, wind, and volcanoes. It is here that the conflict between Pele and the rain god Kamapuaʻa was centered; Halemaʻumaʻu, "House of the ʻamaʻumaʻu fern", derives its name from the struggle between the two gods. Kamapuaʻa, hard-pressed by Pele's ability to make lava spout from the ground at will, covered the feature, a favorite residence of the goddess, with fern fronds. Choked by trapped smoke, Pele emerged. Realizing that each could threaten the other with destruction, the other gods called a draw and divided the island between them, with Kamapuaʻa getting the moist windward northeastern side, and Pele directing the drier Kona (or leeward) side. The rusty singed appearance of the young fronds of the ʻamaʻumaʻu is said to be a product of the legendary struggle. This early era was followed by peace and cultural expansion between the 12th and late 18th century. Land was divided into regions designed for both the immediate needs of the populace and the long-term welfare of the environment. These ahupuaʻa generally took the form of long strips of land oriented from the mountain summits to the coast. A view from Kīlauea's eastern rift zone captured during a USGS expedition. The first foreigner to arrive at Hawaii was James Cook in 1778. The first non-native to observe Kīlauea in detail was William Ellis, an English missionary who in 1823 spent more than two weeks trekking across the volcano. He collated the first written account of the volcano and observed many of its features, establishing a premise for future explorations of the volcano. Another missionary, C. S. Stewart, U.S.N., wrote of it in his journal 'A Residence in the Sandwich Islands', which Letitia Elizabeth Landon quoted from in the notes to her poem 'The Volcano of Ki-Rau-E-A' in Fisher's Drawing Room Scrap Book, 1832. The next era of Kīlauea's history began with the establishment of the Hawaiian Volcano Observatory on the volcano's rim in 1912. The first permanent such installation in the United States, the observatory was the brainchild of Thomas Jaggar, head of geology at the Massachusetts Institute of Technology; after witnessing the devastation of the 1908 Messina earthquake near Mount Etna in Italy, he declared that something must be done to support systematic volcanic and seismic study, and chose Kīlauea as the site of the first such establishment. After securing initial funding from MIT and the University of Hawaii, Jaggar took directorship of the observatory and, whilst its head between 1912 and 1940, pioneered seismological and observational study and observation of active volcanoes. After initial funding ran out, the Observatory was successively funded by the National Weather Service, the United States Geological Survey (USGS), and the National Park Service, before settling on the USGS, under whose banner the observatory has been operating since 1947. The main building has been moved twice since establishment, and today is positioned on the northwest rim of Kīlauea's caldera. NASA used the area to geologically train the Apollo Astronauts in recognizing volcanic features, planning traverses, collecting samples and taking photographs. Training took place in April 1969, April 1970, December 1970, December 1971, and June 1972. Astronauts of Apollo 12, Apollo 14, Apollo 15, Apollo 16 and Apollo 17 used this training on the Moon. Notable geologist instructors included William R. Muehlberger. The volcano has been a tourist attraction since the 1840s, and local businessmen such as Benjamin Pitman and George Lycurgus ran a series of hotels at the rim, including Volcano House which is still the only hotel or restaurant located within the borders of the Hawaiʻi Volcanoes National Park. In 1891, Lorrin A. Thurston, grandson of the American missionary Asa Thurston and investor in hotels along the volcano's rim, began campaigning for a park on the volcano's slopes, an idea first proposed by William Richards Castle, Jr. in 1903. Thurston, who owned the Honolulu Advertiser newspaper, printed editorials in favor of the idea; by 1911 Governor Walter F. Frear had proposed a draft bill to create "Kilauea National Park". Following endorsements from John Muir, Henry Cabot Lodge, and former President Theodore Roosevelt (in opposition to local ranchers) and several legislative attempts introduced by delegate Jonah Kūhiō Kalaniana'ole, House Resolution 9525 was signed into law by Woodrow Wilson on August 1, 1916. It was the 11th National Park in the United States, and the first in a Territory; a few weeks later, the National Park Service Organic Act was signed into law, creating the National Park Service and tasking it with running the expanding system. Originally called "Hawaii National Park", it was split from the Haleakala National Park on September 22, 1960. Today, the park, renamed the Hawaiʻi Volcanoes National Park, is a major conservatory agency and tourist attraction, and, since 1987, a World Heritage Site. In its early days, tourism was a relatively new concept, but grew slowly before exploding with the advent of air travel around 1959, the year Hawaiʻi became a state. Today, tourism is driven by the island's exotic tropical locations, and Kīlauea, being one of the few volcanoes in the world in a more or less constant state of moderate eruption, was a major part of the island's tourist draw. Until its closure on May 11 due to the danger and damage associated with the 2018 Lower East Rift Zone and summit events, Kīlauea was visited by roughly 2.6 million people annually, most of whom proceeded to visit the volcano from the Kilauea Visitor Center near the park entrance. The Thomas A. Jaggar Museum was also a popular tourist stop; located at the edge of Kīlauea caldera, the museum's observation deck offered the best sheltered view on the volcano of the activity at Halema'uma'u Crater. The Volcano House provided the nearest lodging, and the nearby Volcano Village the most numerous; visitors associated with the military could find lodging at the Kilauea Military Camp. A number of hiking trails, points of interest, and guided ranger programs existed, and the Chain of Craters Road, Hilina Pali Road, and Crater Rim Drive provided access. In 2008, a Lava Viewing Area was opened by the county for tourists in Kalapana, on the southeastern side of the National Park, accessible only from State Route 130. ^ a b "4088". NGS data sheet. U.S. National Geodetic Survey. ^ "Kilauea Prominence". Peakbagger.com. Retrieved May 5, 2018. ^ "Kīlauea Volcano Erupts in Explosive and Effusive Cycles". Hawaiian Volcano Observatory – United States Geological Survey. 19 January 2012. Retrieved 15 January 2019. ^ "Hawaii volcano erupts from summit, shooting plume of ash". CBS News. ^ "Into thin air:Lava flows claim Hawaii's largest lake in a matter of hours". Hawaii News Now. ^ "Kapoho Beach Lots, Vacationland destroyed by lava". Hawaii Tribune-Herald. ^ a b "Preliminary summary of Kilauea Volcano's 2018 lower East Rift Zone eruption and summit collapse" (PDF). US Geological Survey. Retrieved 5 December 2018. ^ "Hawaii's Kilauea Volcano May No Longer Be Active After Erupting Almost Continuously for 35 Years, Destroying Hundreds of Homes". KTLA. 2018-12-05. Retrieved 2018-12-06. ^ Israel, Brett. "Kilauea Volcano's Deadliest Eruption Revealed". Live Science. Retrieved 11 May 2018. ^ Wong, Alia (11 May 2018). "Madame Pele's Grip on Hawaii". The Atlantic. Retrieved 11 May 2018. ^ a b c Sherrod, David R.; Sinton, John M.; Watkins, Sarah E.; Brunt, Kelly M. (2007). "Geological Map of the State of Hawaii" (PDF). Open File report 2007-1089. United States Geological Survey. pp. 44–48. Retrieved April 12, 2009. ^ Foulger, G. R; Anderson, Don L. (March 11, 2006). "The Emperor and Hawaiian Volcanic Chains: How well do they fit the plume hypothesis?". MantlePlumes.org. Retrieved April 1, 2009. ^ Clague, David A.; Dalrymple, G. Brent (1987). "The Hawaiian-Emperor Volcanic Chain – Geological Evolution" (PDF). In Decker, Robert W.; Wright, Thomas L.; Straffer, Peter H. (eds.). Volcanism in Hawaii: papers to commemorate the 75th anniversary of the founding of the Hawaii Volcano Observatory. Professional Paper 1350. 1. Washington, D.C.: Volcano Hazards Team, United States Geological Survey, United States Government Printing Office. p. 32. ^ a b c d e f g "Kīlauea – Perhaps the World's Most Active Volcano". Hawaiian Volcano Observatory – United States Geological Survey. 7 May 2009. Retrieved 27 January 2012. ^ a b "Kohala – Hawaii's Oldest Volcano". Hawaiian Volcano Observatory – United States Geological Survey. 20 March 1998. Retrieved 29 January 2012. ^ W. J. Kious; R. I. Tilling (1996). "Hotspots": Mantle thermal plumes (1.14 ed.). United States Geological Survey. ISBN 978-0160482205. ^ a b "Evolution of Hawaiian Volcanoes". Hawaiian Volcano Observatory – United States Geological Survey. 26 March 1998. Retrieved 30 January 2012. ^ a b c d e f g h i j k l "Kilauea: Eruption History". Hawaiian Volcano Observatory – United States Geological Survey. 2 November 2007. Retrieved 30 January 2012. ^ a b c d e f g h i j Ken Ruben (11 May 2005). "Historical Eruptions of Kilauea Volcano: Summary of Eruptions". SOEST – Hawaii Center for Volcanology. Retrieved 26 August 2012. ^ a b John Watson (July 18, 1997). "Lava Flow Hazard Zone Maps: Kilauea". United States Geological Survey. Retrieved 27 August 2012. ^ a b c "Kilauea's east rift zone: an enormous ridge from the summit caldera to the ocean floor". Hawaiian Volcano Observatory – United States Geological Survey. Retrieved 27 August 2012. ^ Miklius, Asta; Cervelli, Peter (2003). "Vulcanology: Interaction between Kilauea and Mauna Loa". Nature. 421 (6920): 229. Bibcode:2003Natur.421..229M. doi:10.1038/421229a. ^ a b c d e f g Christina A. Neal; John P. Lockwood (2003). "Geological Map of the Summit Region of Kīlauea Volcano, Hawaii" (PDF). United States Geological Survey. Retrieved 27 August 2012. ^ "Field Stop 12: Halema'uma'u Crater". University of Wisconsin. Archived from the original on 11 December 2012. Retrieved 27 August 2012. ^ a b D. G. Myer; D. Sandwell; B. Brooks; J. Foster; M. Shimada (2008). "Inflation along Kilauea's Southwest Rift Zone in 2006" (PDF). Journal of Volcanology and Geothermal Research. 177 (2): 418–24. Bibcode:2008JVGR..177..418M. doi:10.1016/j.jvolgeores.2008.06.006. ^ a b c "Volcanic Landforms of Hawaii Volcanoes National Park". Oregon State University. Archived from the original on 8 July 2011. Retrieved 28 August 2012. ^ a b "Kilauea: Eruptive history". Global Volcanism Program. Smithsonian National Museum of Natural History. Retrieved 26 August 2012. ^ a b "Oldest radiometric ages from Kilauea about 275,000 years". Hawaiian Volcano Observatory – United States Geological Survey. 10 September 2007. Retrieved 26 August 2012. ^ a b D. A. Swanson; J. Rausch (2008). "Human Footprints in Relation to the 1790 Eruption of Kīlauea". Eos, Transactions, American Geophysical Union. American Geophysical Union. 89 (53): 2022. Bibcode:2008AGUFM.V11B2022S. ^ a b "Kilauea: an explosive volcano in Hawai'i". Hawaiian Volcano Observatory – United States Geological Survey. July 26, 2005. Retrieved 26 August 2012. ^ a b "The 1840 Kilauea eruption was big, spectacular, and made the Sand Hills". Hawaiian Volcano Observatory – United States Geological Survey. September 3, 2003. Archived from the original on 2013-01-06. Retrieved 26 August 2012. ^ "Revisiting the 1919–1920 Mauna Iki eruption". Hawaiian Volcano Observatory – United States Geological Survey. 4 January 2011. Retrieved 26 August 2012. ^ "The 1924 explosions of Kilauea". Hawaiian Volcano Observatory – United States Geological Survey. 23 July 2001. Retrieved 26 August 2012. ^ "The beginning of a new era – Kilauea's 1952 summit eruption". Hawaiian Volcano Observatory – United States Geological Survey. June 29, 2009. Archived from the original on 2013-01-06. Retrieved 26 August 2012. ^ "The 1960 Kapoho Eruption of Kilauea Volcano, Hawai'i". Hawaiian Volcano Observatory – United States Geological Survey. 24 May 2000. Retrieved 26 August 2012. ^ a b "The Mauna Ulu Eruption: 1969–1974". Hawaiian Volcano Observatory – United States Geological Survey. 26 March 1998. Archived from the original on 2013-01-06. Retrieved 27 August 2012. ^ Program, Volcano Hazards. "USGS: Volcano Hazards Program HVO Kilauea". hvo.wr.usgs.gov. Retrieved 5 May 2018. ^ "Hawaii Volcano Observatory – Thirteen Years of Puʻu ʻŌʻō Erupting". USGS Hawaiian Volcano Observatory. 26 March 1998. Retrieved 18 July 2015. ^ "Surges Interspersed Among Steady-state Activity". Hawaiian Volcano Observatory – United States Geological Survey. 2010. Retrieved 26 August 2012. ^ "Puʻu ʻŌʻō and the Current Eruption of Kīlauea". Hawaiian Volcano Observatory – United States Geological Survey. 13 April 2012. Retrieved 19 June 2018. ^ a b "Chronology of Kīlauea's summit eruption, 2008 - 2017". Hawaiian Volcano Observatory - US Geological Survey. Retrieved 19 June 2018. ^ Global Volcanism Program, 2017. Report on Kilauea (United States). In: Venzke, E (ed. ), Bulletin of the Global Volcanism Network, 42:8. Smithsonian Institution. ^ "Volcano Watch: A busy time at Kīlauea Volcano's summit and East Rift Zone". Hawaiian Volcano Observatory, U.S. Geological Survey. 26 April 2018. Retrieved 19 June 2018. 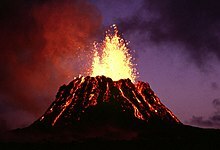 ^ "Volcano Watch: Do recent changes herald the opening of a new vent on Pu'u 'Ō'ō?". Hawaiian Volcano Observatory, U.S. Geological Survey. 19 April 2018. Retrieved 19 June 2018. ^ Hurley, Timothy (18 April 2018). "Scientists warn of possible new vent and lava flow at Kilauea volcano". Honolulu Star-Advertiser. Retrieved 19 June 2018. ^ a b "Volcano Watch: What a day! Eruptions, earthquakes, and a lower lava lake". Hawaiian Volcano Observatory. United States Geological Survey. Retrieved 17 May 2018. ^ "M 6.9 – 16km SW of Leilani Estates, Hawaii". earthquake.usgs.gov. Retrieved 2018-05-04. ^ "26 Leilani Estates homes destroyed by lava, county officials say". Star Advertiser. 6 May 2018. ^ "Hawaiians warned of toxic fumes threat". BBC News. 2018-05-21. Retrieved 2018-05-21. ^ Dayton, Kevin (May 31, 2018). "Lava threatens a key escape route, forces evacuations". Honolulu Star-Advertiser. ^ "Ongoing eruption claims at least 87 homes". Hawaii News Now. May 30, 2018. ^ "State pledges $12M for lava response as number of homes destroyed rises to 600". Hawaii News Now. June 5, 2018. Archived from the original on June 15, 2018. ^ Hawaii County Civil Defense,"East Rift Zone Eruption - 6/18/18 6AM"
^ "East Rift Zone Eruption: Mon, 6/25, 4PM - Update 2". County of Hawaii. June 25, 2018. Archived from the original on June 26, 2018. ^ "Volcano Watch: It's an extraordinary time on Kīlauea Volcano!". Hawaiian Volcano Observatory. United States Geological Survey. 11 May 2018. Retrieved 17 May 2018. ^ "Explosive eruption at Kilauea summit sends ash 30,000 feet into air". Hawaii News Now. May 18, 2018. ^ "Volcano Watch: How to protect yourself from volcanic ash produced by Halema'uma'u explosions". Hawaiian Volcano Observatory, U.S. Geological Survey. 7 June 2018. Retrieved 19 June 2018. ^ "Kilauea Volcano — 2018 Summit and Lower East Rift Zone Brief" (PDF). Hawaiian Volcano Observatory, U.S. Geological Survey. Retrieved 19 June 2018. ^ Angela K., Diefenbach; John W., Ewert; David W., Ramsey (11 October 2018). "2018 Update to the U.S. Geological Survey National Volcanic Threat Assessment" (PDF). USGS. Retrieved 1 November 2018. ^ a b "Global Volcanism Program: Kilauea". Smithsonian Institution, National Museum of Natural History. Retrieved 8 October 2015. ^ "Kilauea — Eruptive History". Global Volcanism Program. Smithsonian Institution. Retrieved 22 December 2018. ^ Ann K. Sakai; Warren L. Wagner; Loyal A. Mehrhoff (2002). "Patterns of Endangerment in the Hawaiian Flora" (PDF). Systematic Biology. Oxford University Press. 51 (2): 276–302. doi:10.1080/10635150252899770. PMID 12028733. ^ H. L. Carson; J. P. Lockwood; E. M. Craddock (1990). "Extinction and recolonization of local populations on a growing shield volcano". Proceedings of the National Academy of Sciences of the United States of America. United States National Academy of Sciences. 87 (18): 7055–57. Bibcode:1990PNAS...87.7055C. doi:10.1073/pnas.87.18.7055. PMC 54681. PMID 11607102. ^ "Three Mountain Alliance Management Plan December 31, 2007" (PDF). Three Mountain Alliance. Retrieved 28 August 2012. ^ "Hawai'i Volcanoes National Park: Plants". National Park Service. Retrieved 29 August 2012. ^ "Hawai'i Volcanoes National Park: Animals". National Park Service. Retrieved 29 August 2012. ^ "Hawai'i Volcanoes National Park: Turtles". National Park Service. Retrieved 29 August 2012. ^ Sara Joy Culver; Michael E. Steinhaus, eds. (2006). Let's Go Hawaii: On a Budget (4 ed.). Macmillan Publishers. p. 213. ISBN 978-0-312-36090-0. Retrieved 29 August 2012. ^ Robert A. Craddock; Matthew Golombek; Alan D. Howard (2000). "Analyses of Rock Size-Frequency Distributions and Morphometry of Modified Hawaiian Lava Flows: Implications for Future Martian Landing Sites" (PDF). 31st Annual Lunar and Planetary Science Conference. Lunar and Planetary Institute. 31: 1649. Bibcode:2000LPI....31.1649C. Retrieved 29 August 2012. ^ Timothy Egan (26 January 1990). "Energy Project Imperils a Rain Forest". The New York Times. Retrieved 29 August 2012. ^ Ashley Tindall (1 September 2007). "Wao Kele O Puna". Retrieved 29 August 2012. ^ Tim Ruel (4 April 2001). "Campbell Estate selling half of land holdings". Honolulu Star-Bulletin. Retrieved 29 August 2012. ^ a b c "Culture: The First Arrivals: Native Hawaiian Uses" (PDF). Mauna Kea Mountain Reserve Master Plan. University of Hawaii. Archived from the original (PDF) on 8 November 2012. Retrieved 2 September 2012. ^ Athens, Stephen; Tuggle, H. David; Ward, Jerome V.; Welch, David J. (2002). "Avifaunal Extinctions, Vegetation Change and Polynesian Impacts in Prehistoric Hawai'i". Archaeology in Oceania. 37 (2): 57–78. doi:10.1002/j.1834-4453.2002.tb00507.x. Retrieved 4 September 2012. ^ Edwin Bernbaum (November 2006). "Sacred Mountains: Themes and Teachings". Mountain Research and Development. International Mountain Society. 26 (4): 304–09. doi:10.1659/0276-4741(2006)26[304:SMTAT]2.0.CO;2. ^ Martha B. Luomala (February 1977). Hawaiian Mythology. Honolulu: University of Hawaii Press. ISBN 978-0824805142. ^ Institute for Astronomy – University of Hawaii (January 2009). "Mauna Kea Comprehensive Management Plan: UH Management Areas". Hawaiʻi State Department of Land and Natural Resources. Retrieved 2 September 2012. ^ "The first written account of Kilauea". Hawaiian Volcano Observatory – United States Geological Survey. 1 August 1997. Retrieved 2 September 2012. ^ E. A. Kay (1997). "Missionary Contributions to Hawaiian Natural History: What Darwin Didn't Know". Hawaiian Journal of History. Hawaiian Historical Society, Honolulu. 31: 27–51. hdl:10524/170. ^ James D. Dana (1929). "Classics of Science: Dana Describes Kilauea". The Science News-Letter. Society for Science and the Public. 15 (426): 359–60. doi:10.2307/3905498. JSTOR 3905498. ^ Various authors (1987). R. W. Decker; et al. (eds.). Volcanism in Hawaii: papers to commemorate the 75th anniversary of the founding of the Hawaii Volcano Observatory (PDF). United States Geological Survey Professional Paper, 1350. 1. United States Geological Survey. Retrieved 2 September 2012. ^ John Dvorak (May 2011). "The origin of the Hawaiian Volcano Observatory". Physics Today –American Institute of Physics. Archived from the original on 23 February 2013. Retrieved 4 September 2012. ^ Russell A. Apple (January 4, 2005). "Thomas A. Jaggar, Jr., and the Hawaiian Volcano Observatory". Hawaiian Volcano Observatory – United States Geological Survey. Retrieved 4 September 2012. ^ Phinney, William (2015). Science Training History of the Apollo Astronauts. NASA SP -2015-626. pp. 233–234, 236, 240–241, 249–250, 252–253. ^ "The Volcano House". National Park Service. 24 March 2006 [Originally published November 1953]. Archived from the original on 23 October 2012. Retrieved 4 September 2012. ^ "The Final Thrust". National Park Service. November 1953. Retrieved 12 October 2012. ^ "The National Park Service Organic Act" (PDF). National Park Service. 25 August 1916. Retrieved 12 October 2012. ^ "Hawaii Volcanoes National Park". UNESCO. Archived from the original on 19 November 2005. Retrieved 12 October 2012. ^ Ruth M. Tabrah (1984). Hawaii: A History. W. W. Norton & Company. ^ "Hawai'i Volcanoes National Park: Hawai'i Island, Hawai'i". National Park Service. Retrieved 12 October 2012. ^ "Kilauea Visitor Center". National Park Service. 18 October 2012. Retrieved 22 October 2012. ^ "Hawai'i Volcanoes National Park: Trip Planner" (PDF). National Park Service. Retrieved 22 October 2012. ^ "Lava Viewing Guide for the Big Island – DIY Activities – Hawaii". Retrieved 5 May 2018. MacQueen, P (2011). "Forward modeling to access and improve gravity network geometry at Kilauea Volcano, Hawai'i". Oregon Undergraduate Research Journal. 1 (1): 24–44. doi:10.5399/uo/ourj.1.1.1551. Geologic map of the summit region of Kīlauea Volcano, Hawai (Map). 1:24,000. Geologic Investigations Series I-2759. United States Geological Survey. 2003. Retrieved 2010-08-09. Geologic map of the middle east rift geothermal subzone of Kīlauea Volcano, Hawaii (PDF) (Map) (1.0 ed.). 1:24,000. Geologic Investigations Series I-2614. United States Geological Survey. 2006. ISBN 1-4113-0659-7. Retrieved 2010-08-09. Wikimedia Commons has media related to Kīlauea. "Kilauea". Global Volcanism Program. Smithsonian Institution. This page was last edited on 24 April 2019, at 18:01 (UTC).